Grant, we pray, almighty God, that, celebrating the mysteries of the Lord's Resurrection, we may merit to receive the joy of our redemption. Through our Lord Jesus Christ, your Son, who lives and reigns with you in the unity of the Holy Spirit, one God, for ever and ever. According to the 1962 Missal of St. John XXIII the Extraordinary Form of the Roman Rite, today is the feast of St. Gregory Nazianzen. He was educated at Athens in all the sciences with St. Basil the Great. He became bishop of Nazianzen and his profound knowledge earned for him the title of Doctor and Theologian, titles confirmed by the Church. He died in 389. His feast in the Ordinary Form of the Roman Rite is celebrated January 2. Historically today is the feast of St. Pachomius, founder of the cenobitical life, born near Esneh, Egypt; died at Phebôou c.346. After spending some time with the hermit Palemon, he withdrew to Tabennisi where he introduced community life among the hermits who gathered around him. Before he died he had established nine monasteries for men and two for women. His order continued until the 11th century. Represented in hermit's garb, or crossing the Nile on the back of a crocodile. Gregory, surnamed the "Theologian" by the Greeks, was born at Nazianz in Cappadocia in 329. He was one of the "Three Lights of the Church from Cappadocia." To his mother, St. Nonna, is due the foundation for his saintly life as an adult. He was educated at the most famous schools of his time — Caesarea, Alexandria, Athens. 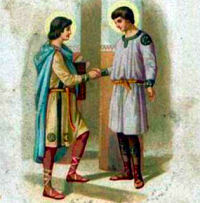 At Athens he formed that storied bond of friendship with St. Basil which was still flaming with all the fervor of youthful enthusiasm when he delivered the funeral oration at the grave of his friend in 381. Gregory was baptized in 360, and for a while lived the quiet life of a hermit. In 372 he was consecrated bishop by St. Basil. In 381 he accepted the see of Constantinople, but grieved by the constant controversies retired again to the quiet life he cherished so highly and dedicated himself entirely to contemplation. During his life span the pendulum was continually swinging back and forth between contemplation and the active ministry. He longed for solitude, but the exigencies of the times called him repeatedly to do pastoral work and to participate in the ecclesiastical movements of the day. He was unquestionably one of the greatest orators of Christian antiquity; his many and great accomplishments were due in great measure to his exceptional eloquence. His writings have merited for him the title of "Doctor of the Church." We too must harmoniously combine the two phases of spiritual life, the contemplative which tends to solitude and the active or pastoral which responds to the need of the times and the good of souls. St. Pachomius can justifiably be called the founder of cenobitic monasticism (monks who live in community). Even though St. Antony the Great was the first to go into the desert to live a life of seclusion pursuing evangelical perfection, he lived an eremitic life, that is, a primarily solitary life. Pachomius first started out as a hermit in the desert like many of the other men and women in the third and fourth centuries who sought the most radical expression of Christian life and he developed a very strong bond of friendship with the hermit Palemon. One day he had a vision during prayer in which he was called to build a monastery, and was told in the vision that many people who are eager to live an ascetic life in the desert, but are not inclined to the solitude of the hermit, will come and join him. His hermit friend Palemon helped him to build the monastery and Pachomius insisted that his cenobites were to aspire to the austerity of the hermits. 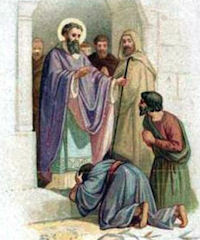 However, he knew that his idea was a radical one, in that most of the men who came to live in his monastery had only ever conceived of the eremitic lifestyle; his great accomplishment was to reconcile this desire for austere perfection with an openness to fulfilling the mundane requirements of community life as an expression of Christian love and service. He spent most of his first years as a cenobitic doing all the menial work on his own, knowing that his brother monks needed to be gently inducted into serving their brothers in the same manner. He therefore allowed them to devote all their time to spiritual exercises in those first years. At his death, there were eleven Pachomian monasteries, nine for men and two for women. The rule that Pachomius drew up was said to have been dictated to him by an angel, and it is this rule that both St. Benedict in the west and St. Basil in the east drew upon to develop their better known rules of cenobitic life. Read this longer life of St. Pachomius on the EWTN website.